The aim is to introduce English language to new learners and beginners, and learners wishing to build their vocabulary. Language is often acquired and learning can be fast. Unlike General English, the grammar and structure remains at simple levels. The focus is on listening, speaking, and vocabulary. Materials: Handouts are provided and build into a reference as the course goes along. Books for vocabulary and practice are available. There is also a starter language pack containing reference material. Classes are run as an open group or private classes with a Thai teacher. The focus is on the structure and use of everyday English, and there are six main learning levels. Includes the study of vocabulary, language structure, pronunciation, and language skills (reading, writing, listening and speaking) with a native English teacher, or an experienced Thai teacher. Materials: Professional course books are provided. Multimedia material includes interactive DVD and online practice. These courses offer blended learning. This means there is enough extra support material to revise, self-test and self-study at home as well as with a teacher in class. Business English is suitable for elementary to advanced level students (starter level available). The focus is on the function and use of English for business. This means the language is more focussed on the language and vocabulary used in business situations. Language structure is included along with practice of the language skills (reading, writing, listening and speaking). Materials: Professional course books are provided. Multimedia material includes interactive DVD and online practice. These courses offer blended learning. This means there is enough extra support material to revise, self-test and self-study at home as well as with a teacher in class. This course is also available as a complete online course with, or without teacher support. English for young learners is available for all student levels. The young learner courses at PLC School focus on revision and exam preparation. Class time is used to revise subjects, or course books are used to prepare for a Cambridge exam (YLE Starters, Movers, Flyers). A main learning objective is the introduction of reading and language activities to support an existing curriculum as extra practice/study. Materials: Professional course books are provided if required. Multimedia material is available during class time and online references are provided for self-study or practice. A1 tests for visa, Cambridge KET (elementary English), and intermediate/advanced level exams for relocation, work or study abroad. PLC School uses professional placement tests to assess current ability. Once the results are known, students are advised about the most effective study options to either improve test scores, or how to progress to an appropriate level before taking an exam. Materials: Professional course books are provided if required. Multimedia material is available during class time and online practice tests are available to buy for self-study and exam practice. All students are given a placement test to assess their needs and ability. 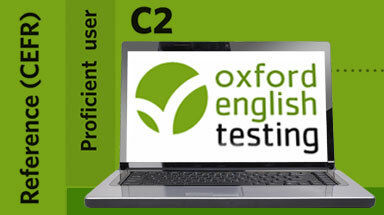 Test results will provide a guide to your current level on the international CEFR scale. Recommended: PLC School highly recommends the full online Oxford test to place your level accurately, and to provide a recognized CEFR reference for employers, schools or colleges. There is a small charge for the online test.